RAPNET PRESS RELEASE, February 4, 2019, Las Vegas… RapNet, the world’s largest diamond trading network, announces the introduction of jewelry into its global trading network. 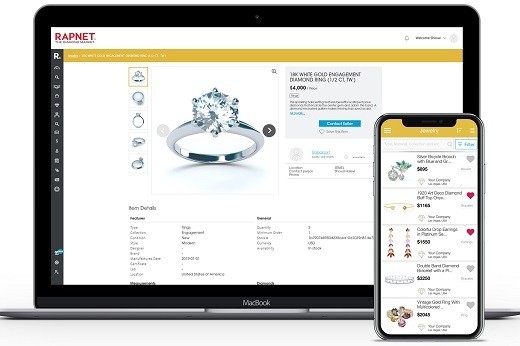 RapNet members can now upload jewelry images and data, perform detailed searches, and directly trade jewelry with each other without any fees or commissions. There are no additional fees to use this service. RapNet members seeking to download jewelry items for sale or learn more about RapNet’s new jewelry initiative are invited to visit www.rapnet.com/jewelry or email service@diamonds.net. Customer service representatives are also available in the following locations. About RapNet: RapNet, a member of the Rapaport Group of Companies, was established in 1992. It is the world’s largest diamond trading network, daily listing over 1.5 million diamonds valued at more than $7.4 billion and hosting members in 97 countries. RapNet provides a competitive and transparent peer-to-peer trading network with no commission charges. Additional information is available at www.RapNet.com.